This sentence in Stella's first enquiry for a Paris photoshoot made my heart skipped a few beats and yearned to be her Paris photographer : "What I am looking for is a marriage between how fun and playful I am and classy Audrey Hepburn... brought together by Paris landscape." Listen to this, I exclaimed to my husband. He responded excitely : "THIS IS EXACTLY YOU!!!! Go get her! She absolutely needs you to be her Paris photographer - a match made in heaven." I strongly agreed. The most exciting part of your planning for Stella's Paris photoshoot was deciding what to wear and at which location. I sent her some links to outfit examples, she returned with pictures of what she's bought. So girly. It's like planning a party in Paris. On top of that, she was hiring a hair and make up artist to complete the look. Fabulous! I loved that Stella knew how to value and celebrate herself as a woman. A woman whose been through what seemed like a cat with nine lives and came out gracefully. Being her Paris photographer was an honour! She truly was a free spirited Audrey Hepburn. Like a true star, revelling in her Paris photoshoot. Like a true star, playing her role in front of her Paris photographer with no inhibitions. Paris shuts down in August. Local business owners go on vacation for a month. So buying balloons in advance was a challenge. Fortunately, we both believe in prayers. Half an hour into our photoshoot, there appeared another Paris photographer whose clients had balloons. What are the odds at 6:30am in the morning? I ran up to them, politely asked if we could borrow the balloons for five minutes... It's a good thing to have faith in prayers! I loved every minute of being Stella's Paris photographer. We talked, shared our hearts, laughed. Like a pair of girlfriends deciding to spend the day together, in Paris. Except that we had only met for the first time. You see, your Paris photoshoot can be meaningful if you would like it to be. It's hours that you will put into that you'll never get back as with anything in life, so it felt great that our three hours photo session time together was enriching. It definitely didn't feel like work, even though I had to conducted myself as Stella's Paris photographer. 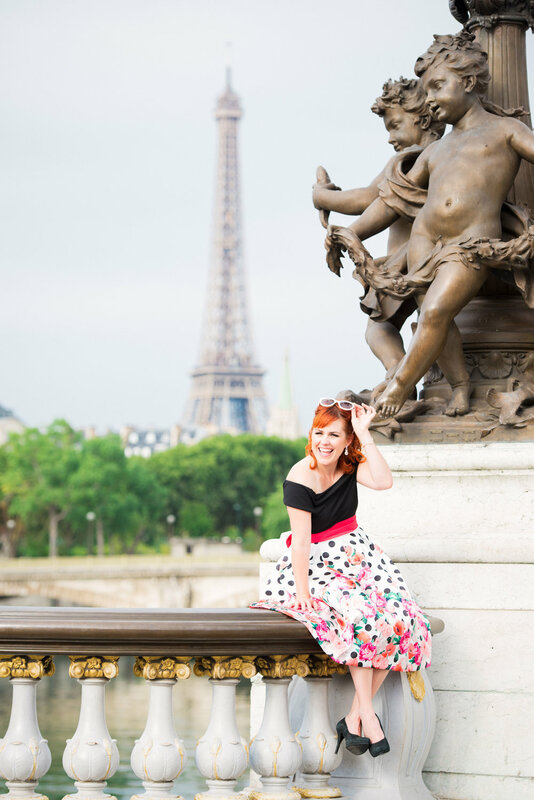 "For 20 years I had been dreaming of traveling to Paris and decided to commemorate the trip by hiring a photographer. From start to finish Shantha was amazing. She and I talked beforehand about my vision (which was Audry Hepburn meets Paris), the locations that would be beautiful backdrops, and the clothing and props I would want to bring. I had such a good experience planning with her which could have been scary considering I was planning it from the USA. Shantha made it fun and easy. The day of the shoot came and it was everything I hoped it would be and then some. I now have the best souvenirs to show of a city I love and memories I will never forget. I would highly recommend her to anyone looking for a fun, beautiful, and professional photoshoot in Paris. You will be so happy you did!" If you'd like a well thought out Paris photoshoot with a Paris photographer that would share the vision of your photo session outcome, I'd be delighted to hear from you.